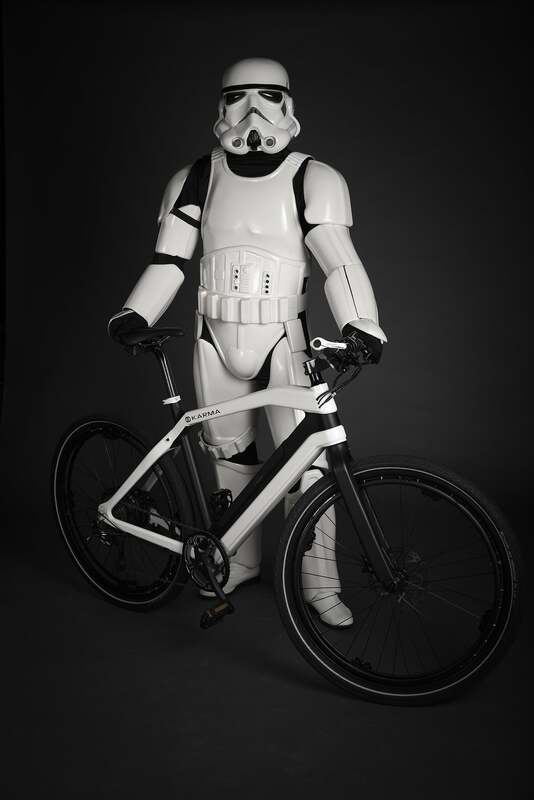 Zeitgeist's carbon-fiber electric bike will go up to 100 miles on a charge and looks like it was built for the Empire. Electric bikes have a problem. They can be as clunky as a moped, have limited range, and get shunned by other cyclists when used in bicycle lanes. Zeitgeist hopes to address these concerns with the Beta X, an electric bicycle that fuses Scandinavian design with what could be one of the lightest eBike builds around. We went hands-on with the Beta X and spoke with company execs about the creative decisions that go into producing an electric bike that, frankly, looks like it was designed for an Imperial Stormtrooper. The Zeitgeist uses a carbon fiber frame to keep weight down. 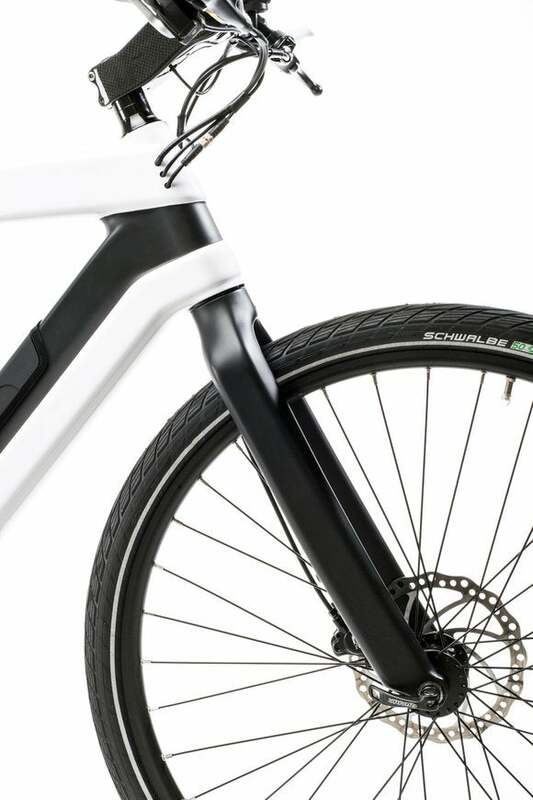 One of the big knocks with eBikes is excessive weight, so Zeitgeist builds the Beta with a carbon fiber frame to shed pounds. 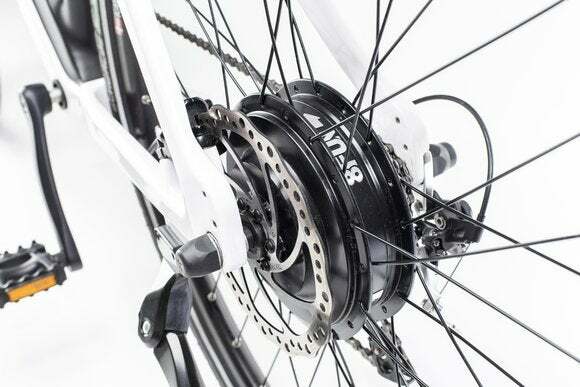 While competing alloy bicycles might weigh 55 lbs. to 65 lbs. Zeigeist said the Beta X weighs in at 44 lbs. That’s still much heavier than a typical commuter bicycle, might weigh 15 lbs. to 25 lbs., but commuter bikes don’t have batteries and an electric motor, either. There’s no suspension on the Beta X but carbon fiber generally rides softer anyway. Big 700c balloon tires also make the ride a little cushier. The Zeitgeist Beta uses standard lithium ion cells in an easily removable battery pack. The Beta X's battery pack uses commodity lithium ion cells commonly found in laptops. The pack is easily removable so it can be charged away from the bike or swapped with a fresh pack. 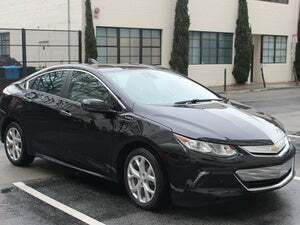 The company says it will charge in 4 hours, which is less than a typical work day. But with the Beta X's 80- to 100-mile range, you shouldn’t have to charge it every day. A torque sensor in the drive train adds more power to the motor as you pedal harder. After 28mph, due to laws regulating electrict bikes, all the work is on you. Electric bikes feature either throttle controls on the handle bar, or torque sensors that adjust your bike's speed based on hard you pedal. 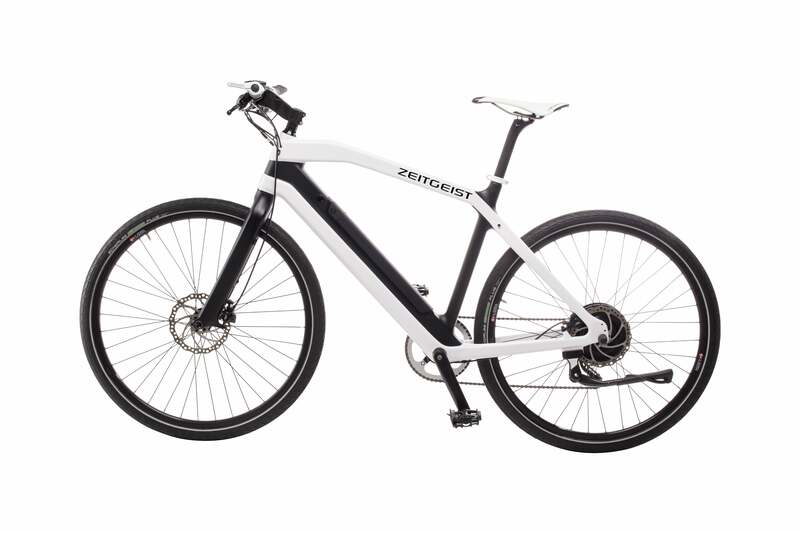 Zeitgeist chose to design around the latter “pedelec” design. Pedal-based electric bikes also skirt laws regarding electric bicycles and their top speed. 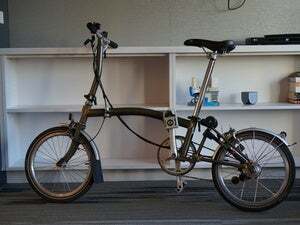 A throttle-based bicycle that moves on its own power, without having to pedal, is legally required to stay under 20 mph to avoid being classified as a motorized vehicle. If it exceeds that speed, helmet laws as well as motorcycle licenses and registration would be required. But some states, such as California, have passed laws allowing pedelectric-bikes that only assist the rider to hit a maximum speed of 28 mph. Once you exceed 28 mph, it’s just your legs doing the work as the motor is turned off to remain legal. Zeitgeist execs said another side effect of the pedelec power, combined with the sleek design of the Beta X, is that most people won’t know it’s electric. Electric bikes haven’t been embraced by all bicyclists, and having a 250 lbs. mouse potato ring his bell as he smokes a Lance Armstrong wannabe on a steep hill climb probably won’t help. With the Beta X, Lance won’t even know what happened. The hub motor is rated for 500 watts of power and is fairly compact too. If you’re expecting this bicycle to cost $399, you better dig deeper—and add another 9. Yup, it's $3,999 for the Zeitgeist Beta X, and that’s just the starting price on the Crowd Supply crowdfunding campaign. 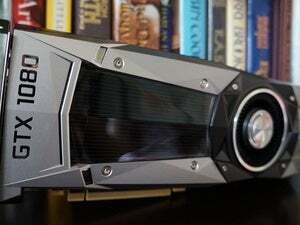 The Beta X looks like it’ll hit $5,000 when it goes into full production. Initially, 100 units will be made for the Crowd Supply campaign, with plans to go into full production of the Beta by October. 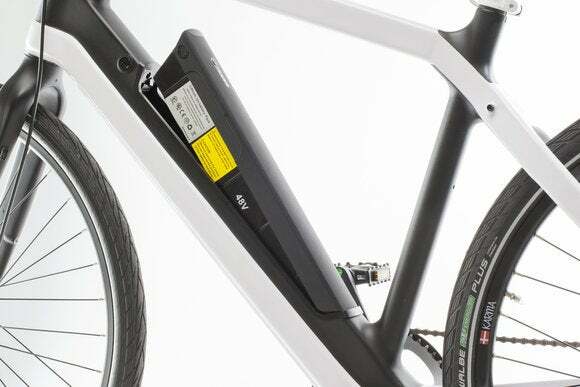 The cost may seem high, but company execs say that’s actually a good price, as competing eBikes with similar power plants but more weight range from $6,000 to $7,000. To a bicycling enthusiast who takes the week off to watch the Tour de France, dropping $5k on a bicycle is part of the life style. But to a regular Joe or Jane? Yeah, it’s going to take some serious justification for most of us. If you live in a traffic-congested city like New York or San Francisco, however, a vehicle that lets you effortlessly go 10 or 15 miles and bypass that gridlocked traffic is something that just might be worth the money. We’ll see when when I get one in for a ride of the electric bicycle lifestyle. All I’ll need is my Stormtrooper armor to go with the Beta X’s stark looks. 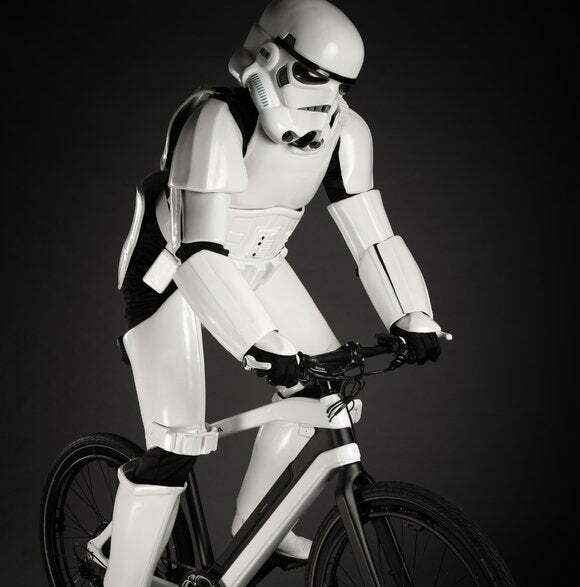 The Empire has gone green and traded its Scout Bikes for Electric Bikes.